Footwear industry is an important sector of leather industries in India, distributed in various locations. It is divided into organized and unorganized (mainly craft based). Kolhapuri Chappal (footwear) is prominent among all craft based footwear manufacturing. This craft which has significant presence in local and national economy (export and domestic market), is a cottage based industry and mainly family entrepreneurship. The entire manufacturing process is divided into various steps and steps are divided among male and female workers of the house. Female workers are mostly involved in less forceful activities. But while doing, female workers occupy apparently various non-optimal postures which may lead to development of musculoskeletal and other occupational disorders. To understand the above a study was taken up for identifying the working postural load and its effect. The current working conditions and the frequencies of MSD symptoms of 51 female workers were evaluated. Musculoskeletal health data were collected through standard questionnaire and RULA was used for postural load analysis. SPSS version 20.0 was used for statistical data analysis. Age, height and weight of the subjects were 33.6 (±13.17) years, 152.3 (±3.2) cm and 51 (±4.3) kg respectively. The results of postural load analysis revealed that there is need for effective implementation of intervention program and some changes are required immediately with respect to their current workstations. Further it has been identified that there is a high prevalence of musculoskeletal pain among female workers at low back followed by neck, knee and upper-back. Further in understanding the relation with the postural load and types of musculoskeletal pain, it was found that there are association with RULA grand score and prevalence of low-back pain. The above result is comparable with other available literature of similar types of industry. As this occupation is very specific in nature it requires further investigation in detail. 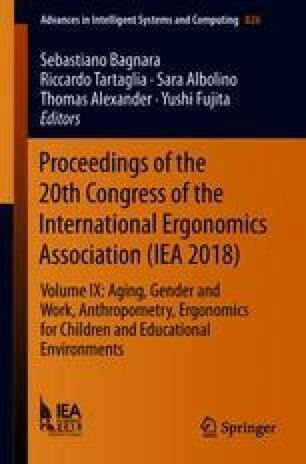 The authors express their truthful appreciation to all those footwear manufacturing workers who rendered enormous assistance during the completion of this study. Also they express their sincere gratitude to all the students who helps the research team to collect field data. Further they express their gratitude to Mr. Hemant Shete for his contribution during this whole project.